Middle of the week. School restarted after the winter break. One child off to school today. That is good. University still on break so the other is still at home. Not so good. 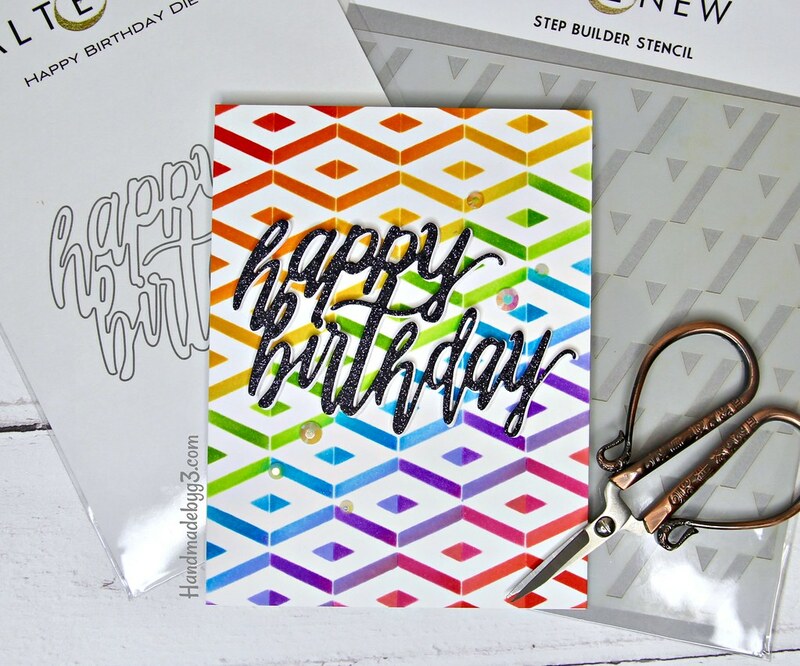 Anyway, I am here today sharing a rainbow background card using Altenew’s new Step Builder Stencil. I have channelled my inner Laura Bassen here. She is the queen of rainbows on her projects. Thank you so much Laura for your fabulous inspirations. To create this rainbow background I used distress inks in two shades of each colour. On my first tep with the stencil, I used the lighter shades of rainbow colours. The colours of distress inks I used are Abandoned Coral, Worn Lipstick, Shaded Lilac, Salty Ocean, Twisted Citron, Mustard Seed and Carved Pumpkin. Then I cleaned the stencil and flipped it over and sponged with the darker shades of the rainbow colours. The colours of distress inks I used are Candied Apple, Picked Raspberry, Wilted Violet, Mermaid Lagoon, Mowed Lawn, Fossilised Amber and Spiced Marmalade. Removed the stencil and there is the gorgeous shaded rainbow background. I am in love with it. I also like the depth the shading gives. 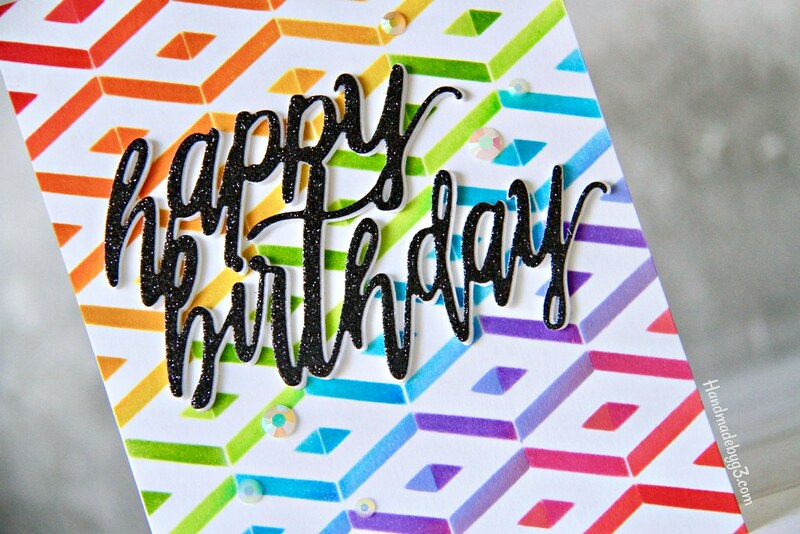 I didn’t want to take away the highlight from the rainbow background, so I kept the rest of the card simple with a contrasting big sentiment die cut. I have used Altenew’s Happy Birthday Die. I die cut one using SImon’s Black glitter cardstock and three out of white cardstock. I stacked and glue them all with the black glitter die cut on top. Then adhered this to the top centre of the rainbow background. Then added a few Studio Katia diamonds. 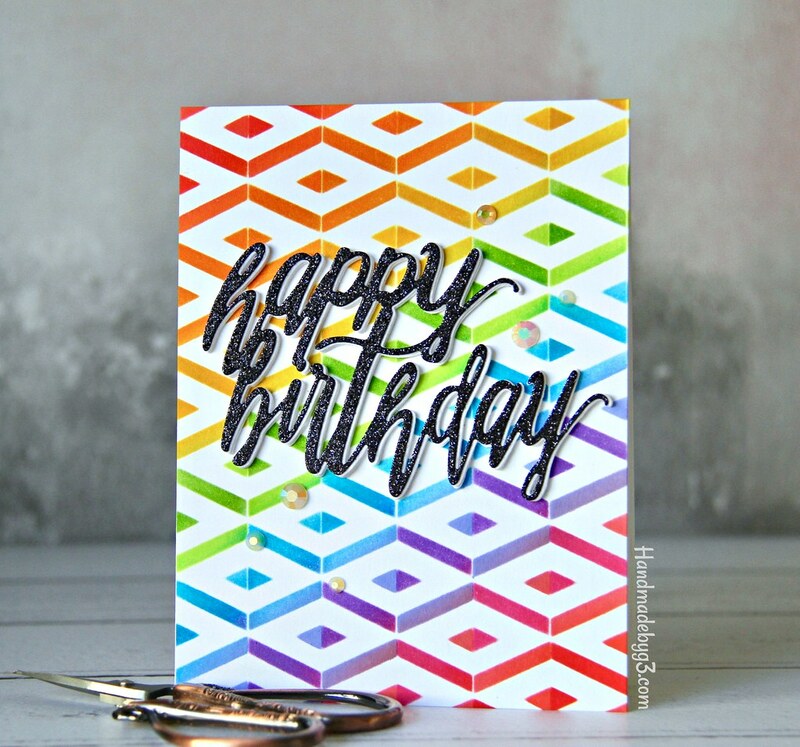 I am loving rainbow background and simple cards at the moment. Stencils are great way to achieve it. 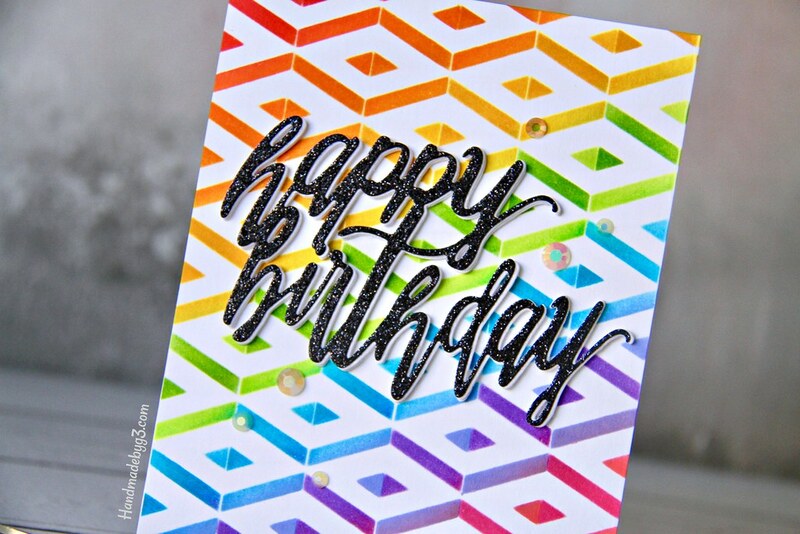 I have another rainbow background card coming next week using another of Altenew’s Stencil. So stay tuned. All the supplies used to make this card are listed below for you. What a fabulous card!! I love your colors! Great job! This is such an amazing use of this stencil! Love it with just the bold “happy birthday”!